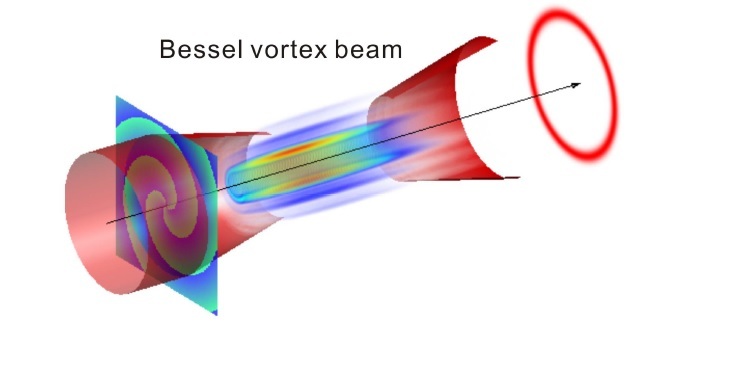 We investigated the nonlinear filamentation of Bessel Vortex beams : these beams are propagation invariant in the linear regime and carry orbital angular momentum. We have experimentally investigated the filamentation regime in fused silica by developing a novel approach of 3D direct reconstruction of the spatial fluence (ie integrated intensity), that allows for direct comparison with numerical simulations. Technical difficulty pays: we obtain quantitative agreement between experimental and numerical results. 3 nonlinear regimes were found : stationary, rotating and "speckle like". The stationary regime develops a hollow tubular plasma. We anticipate many applications for guiding light and electromagnetic waves as well as in the field of laser materials processing. The article reporting our findings has been published in Scientific Reports (click here) and the details of the mathematical approach developed in collaboration with A. Couairon's group is detailed in Optics Express (click here).